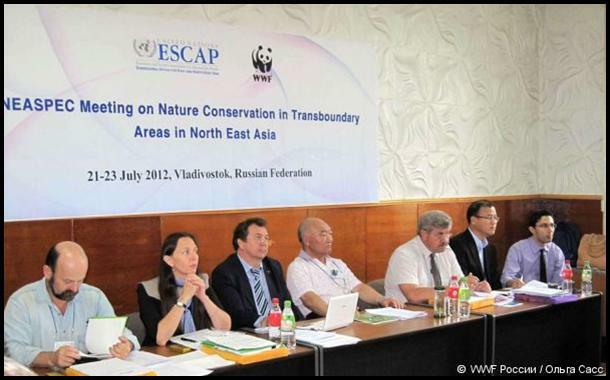 From 21 to 23 July 2012, UNESCAP Subregional Office for East and North-East Asia (SRO-ENEA) and the Far East Office of WWF Russia organized the NEASPEC meeting on "Nature Conservation in Transboundary Areas in North-East Asia" in Vladivostok, Russia. The meeting consisted of a one-day seminar on conservation of Amur tiger and Amur leopard and a two-day field trip to a tiger habitat in Orlinoe hunting estate. The meeting facilitated in-depth analysis of the current situation in bilateral cooperation between China and Russia on scientific research and policy measures to enhance joint efforts to protect tigers and leopards and their habitats. The meeting participants (totaling 30 researchers, NGO representatives and government officials) particularly welcomed recent development of bilateral cooperation agreements between different scientific and government agencies on provincial and state levels and identified additional opportunities to enhance cooperation on conservation of flagship species.